Both LendingTree and SoFi are well-known names in the finance industry. You can get loans of varying types from both including mortgages, personal loans, credit card loans, business loans, auto loans, reverse mortgages, and student loans. But, there are also differences between the 2 that make each stand out. For example, LendingTree is a lending exchange, while SoFi is a direct lender, and in fact, can be found within the LendingTree lender portfolio. LendingTree provides several loan offers from its large network, while SoFi provides loans directly. With so many variables to consider, how can a borrower decide which of these reputable companies is the right one for their present financial needs? 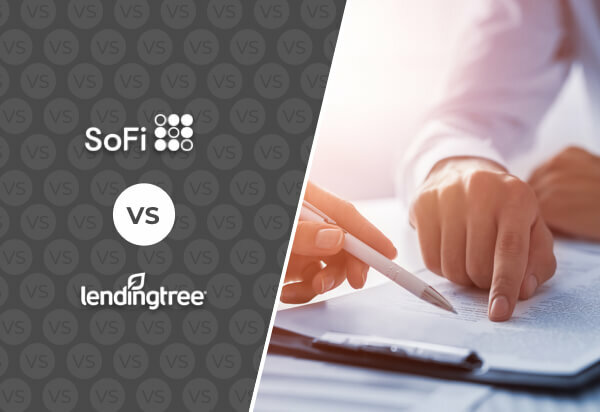 We’ve put together a basic business comparison to help borrowers see the differences between LendingTree and SoFi so that they can come to an educated decision about which one will be the best personal loans provider for them. Take a look. LendingTree has a quick and easy online application that only takes minutes to complete. Many people prefer this method because, with one application, borrowers are automatically connected to numerous lenders. This saves time on repetitive application filings and gives borrowers a more competitive edge wherein lenders are competing for their business. All the potential borrower needs to do is fill out a few basic questions such as name, phone number, and current employment status, upload a few documents, and the process is complete. The one drawback that borrowers should be aware of is that they will receive many contact attempts from various lenders once their application is sent out. SoFi also has an easy online application, so in terms of ease of use, the two even out. Where LendingTree takes the lead in this department is in the number of borrowers that will see that application. With SoFi, it’s one offer only; take it or leave it. LendingTree delivers multiple offers with one easy application. If approved, you’ll receive your loan within a few days. Possibly the most important factor to consider when taking out a personal loan is the terms that will come along with the loan. The minimum and maximum amount you are able to borrow, how long contracts are for, does the company do a soft or hard credit pull, APR, and interest rates are vital components and should weigh heavily in your decision-making process. As such, this section should play a significant part in your considerations towards the best personal loan company for you. SoFi offers excellent terms, some of the best in the market in fact. Delivering an APR range of 5.74% - 16.99%, borrowers can get loans and pay them back for considerably less than anywhere else. That’s significantly lower than most other lenders who go upwards of 35% and leagues below what traditional banks are charging. The loan range is also considerably higher than many lenders, with a minimum loan of $5,000 and a maximum of $100,000. So, entrepreneurs looking to launch a new startup or invest in another business venture can do so without feeling inhibited by their loan amounts. Additionally, SoFi lets members pay off debt over 2-7 year contracts for more flexibility and easier payment plans. LendingTree is more complicated. Because you are dealing with numerous lenders, the loan terms and conditions will vary depending on which lender you opt for. APR ranges can be anywhere from 3.99% - 35.99%, or more. LendingTree deals with smaller loans ranging from $1,000-$35,000 and contracts range from 3-180 months. SoFi is known for its strict eligibility requirements. They’re looking for a specific clientele, and many people will not fit that description. The basic SoFi demographic is young, informed, fin-tech-ready and able go-getters. The lender is interested in younger professionals who have a solid employment history and a good track record of keeping their income to expenses at a healthy balance. The general loan eligibility criteria includes US citizens or permanent residents 18 years of age or older who are either employed or have an offer to start employment within 90 days. SoFi personal loans are not eligible in Nevada or Mississippi, but they are available in the District of Columbia. Generally, SoFi also takes financial history, career experience, and monthly income vs. expenses into account. What’s more, this loan company frequently accepts credit scores of 700 or greater, though they will consider lower credit scores if all the other variables are in your favor. As is the case with loan terms, the LendingTree criteria work on a different scale because there are varying criteria based on the lender of choice. As mentioned, SoFi is one of LendingTree’s lenders, so if you are looking for a loan from this company, the eligibility will hold the same stringencies as a straight up loan from SoFi. Alternatively, some of the other lenders in the LendingTree gamut are a lot more flexible in their acceptance policies. LendingKey, for example, accepts applicants with lower credit scores and prefers bringing a co-signer into the picture rather than relying solely on the borrower’s past credit history. LendingTree partners also accept applicants with 660 credit score, and often even lower. *SoFi is also flexible with late payments fees. If for example, a borrower knows they are going to be late on a payment, they can contact SoFi and arrange an alternate payment plan for that month, giving them time to reorganize their finances and make payments in a timely fashion. LendingTree takes the more traditional approach to personal loans and offers some neat online tools and widgets such as a live mortgage rates tracker, mortgage/loan calculators, free credit scores, credit/financial education, insurance quotes comparison calculator, and other loan calculators. While these are useful, they cannot compare the breadth and depth of involvement that SoFi offers its customers. At the end of the day, LendingTree and SoFi really cater to different audiences. LendingTree is the best option if you have a spotty credit history or are looking for multiple offers to hone in on the best one. SoFi is the lender of choice for the more tech savvy, ambitious millennials who are planning on going from strength to strength and just need a foot up to get themselves started. It’s also the better choice if you have decent credit and can afford to be choosy. This is because SoFi offers better terms, so you'll end up paying less over time than with the LendingTree and has stronger benefits like unemployment protection. So, while LendingTree is a solid option, SoFi really pulls ahead in most departments. If you can afford to be picky, go with SoFi for better rates, more options, and the unparalleled community experience you won't find anywhere else.